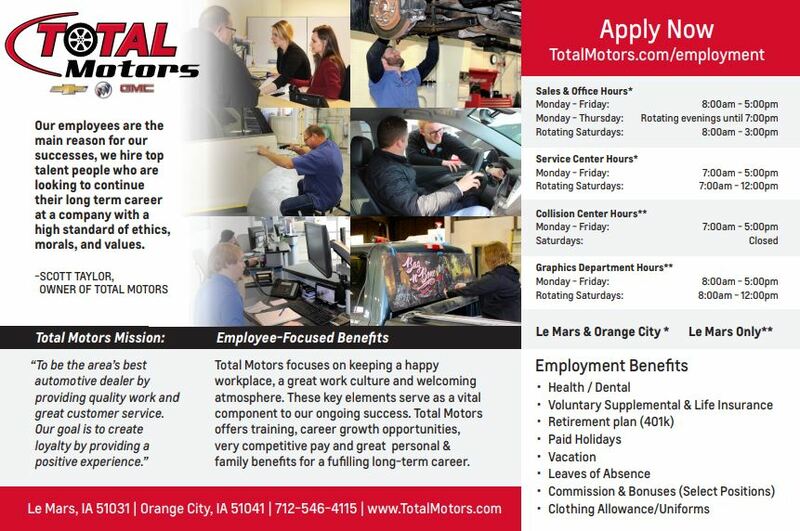 Total Motors of Le Mars is Dedicated to serving all your automotive needs! You will find all the information you need to buy a car right here on our website for Total Motors of Le Mars. Search through our extensive selection of new and pre-owned cars, trucks, vans, crossovers and SUVs. Request a price quote on a new vehicle of your choice at any one of our locations. Enjoy prompt, quality service from our Certified Service Center. Make an appointment or order parts online. Feel free to send us an email if you have any special requests. We also provide an online car finder if you would like extra help finding your new vehicle. Our website is updated daily and all correspondence submitted will be given immediate attention. Our friendly, experienced staff will be happy to help you in the search for your next vehicle at Total Motors of Le Mars. Thank you for visiting Total Motors of Le Mars online - we look forward to service all of your automotive needs for many years to come. Thank you for growing with us!